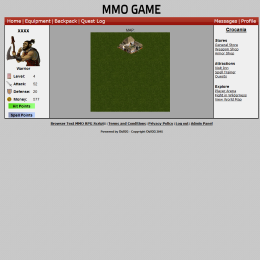 We are designing this script so that someone with no programming knowledge has the ability to start there very own browser based MMORPG. Once a class is chosen, Players always have something to improve on weather it's gaining levels, improving stats (Attack, Defense, Health, Mana) or gathering more gold. You have the ability to name each place on the map as well as custom greetings and names for shops and inns. Allow your players to gain benefits in game by using subscribing or by placing ads within the game. Players have the ability to run there own guild which includes promotions and demotions inside the guild. Players can fight monsters to gain items, gold and experience to level up their characters. Players if they dare can fight other players in the same location they are at for a chance of stealing some gold. Shop around at different shops including a weapons store, armour store, Magic Store and Inn. Once you have the script installed you can set yourself up an Administration account (As well as others) and access the back end of the website where you can set all the specifics of your game. Add, Edit or Remove: Weapon and Armour stats and location. Add, Edit or Remove: Monsters with attack, defense, level, hp, experience and drops. Add, Edit or Remove: spells in the game that players use there mana to cast. You can set specific spells for each class. Edit, Add or Remove: items that can be found around the world by killing monsters around the world. Edit, Add or Remove: Have as many levels as you like and list the experience needed for each. Add, Edit or Remove: All player details can be edited not limited to stats, location, guild and permissions. Add, Edit or Remove: Players create and manage there own guilds but if you need to you can change them around. Add, Edit or Remove: Create your very own quests that players can choose to complete for items or gold. Edit: Have custom text for when people visit Inn and Stores around the world map. Edit, Add or Remove: Name the places players can visit including level requirements on the world map. Information on how to change your ad code by just copying and pasting it. In future you'll be able to do this on this page. Edit all the information your players will ever see such as the game story, class information and the games guide. Edit: If you have the SQL experience their is an area to run code. This can also be deleted for security. Edit: Settings such as players regeneration, ads, premium settings, website information and more!